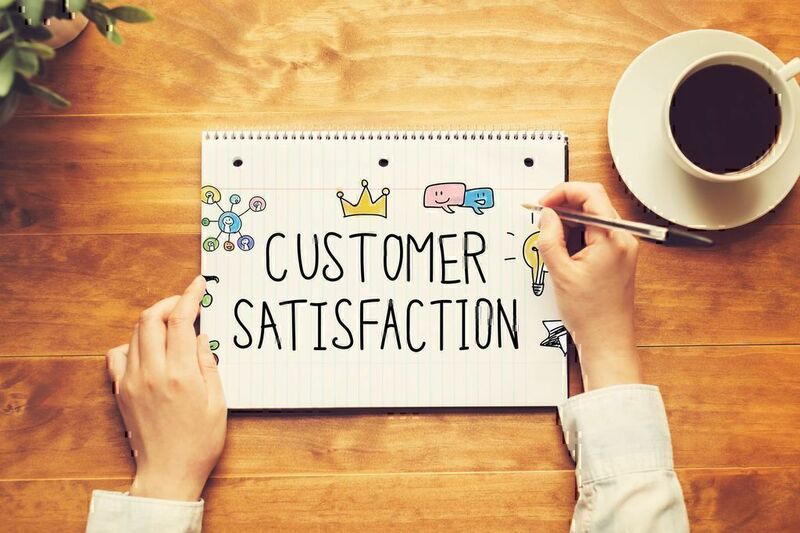 Businesses are quickly discovering the importance of transparency when it comes to finding ways to improve customer satisfaction. It’s easy to work with people who are transparent because we know what they are doing and we know why they are doing it. No hidden agendas, no secrets, no potential backstabbing. In fact, to build a real relationship, there must be transparency between individuals. The same can be said for companies. Consumers today are not looking for shrills and ads that tell buyers what they think we want to hear. Consumers are beyond tone dead advertisements and marketing. They are interested in companies that are approachable. Companies that are comfortable admitting failure. Companies that are honest. Social media has allowed us to control the release of information about ourselves and our experiences. 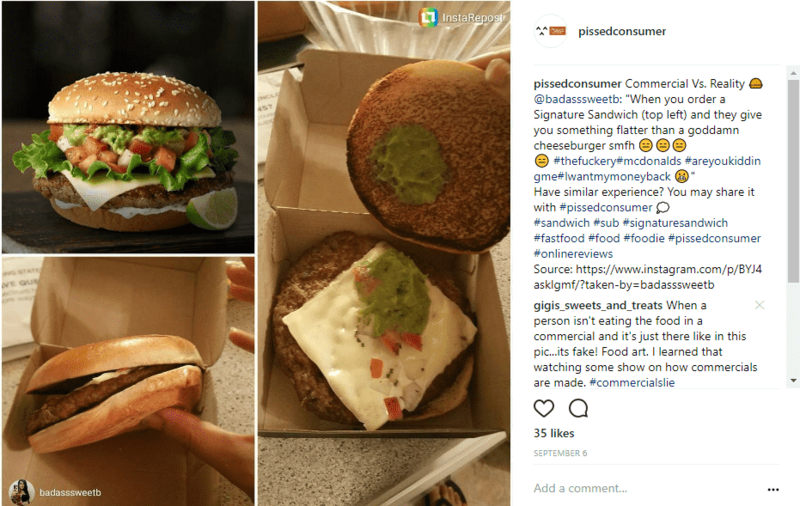 McDonalds learned this lesson in a big way when a customer posted a “Reality versus Commercial” post showcasing what was actually served in the restaurant versus what was advertised. The post went viral. Customers used images to express their frustration (and a fair bit of humor) about what was advertised by the burger giant next to what was actually delivered. It didn’t show McDonalds in a very good light. AvasFlowers has been the subject of similar posts. Frustrated customers ordered a floral arrangement based on advertised images. The flowers that were delivered did not come close to what was advertised and customers have been vocal in their disapproval. We can manipulate our feeds and images to show us in the best possible light, and many companies are doing the same. While it is true that showing the best features and the best reviews falls into a realm of transparency, showing a carefully cultivated image often rings false with consumers – they know when things are off. This is partly because companies can’t control every message out there. They can control what they release, but they can’t control the reviews, the posts, or the social media conversations taking place off their own social media accounts. Additionally, trying to keep secrets within a company is dangerous business. Our current society celebrates whistle-blowers and hackers who discover and share secrets. We don’t like companies who try to keep things under wraps – and we revel when those secrets explode across the news and social media. It makes sense when you realize that for every customer complaint, there are 26 other unhappy customers who have remained silent, according to Lee Resource. That’s a lot of unhappy people waiting for revenge – even if it just the social media kind. Many companies are realizing the key needed to improve customer satisfaction is fully honest transparency. Customer feedback importance is not to be underestimated. Business transparency ultimately boils down to trust. Sharing both the positive and negatives makes companies vulnerable. Many companies have been the subject of brutal social media campaigns when things go wrong. Samsung is still working to rebuild its reputation after the company’s Note 7 phones began catching fire. A company that designed cutting edge technology apparently couldn’t understand what was causing the fires. It offered one solution that actually increased the problem instead of resolving it. When the Samsung Galaxy Note 7 first appeared, reviewers were impressed and highly recommended it. It was found to be one of the best phones of the year by CNET and special features included an excellent camera, an advanced screen and a nice big battery. Everyone was shocked when the first reports appeared that those beautiful new phones with their beautiful new batteries were actually bursting into flames. After the initial reports of fire, Samsung announced a complete recall of the Galaxy Note 7s in the United States, Canada, Europe and Asia. Just a few weeks later, the recall appeared to be working – old Note 7s were being replaced by new safer phones. But then reports arose that the new, “safe” phones were experiencing the same problem – battery fires. After the second round of embarrassing and highly dangerous malfunctions, carriers quit selling the Note 7 and soon Samsung issued a statement that sales would halt completely. Samsung encouraged customers to return the phones and exchange them for something safer, but some customers chose the keep the phones despite the warnings and severity of the issues. Eventually authorities in the United States banned the sale of the phones and forbid passengers to bring the Note 7 onto airplanes. The FAA banned the phone for all flights. Even with these measures, 125,000 faulty Samsung Galaxy Note 7 phones were in use by customers. Finally, Samsung pushed an update to the phones that limited battery capacity and functionality. The phones turned into expensive bricks, but bricks that at least wouldn’t catch fire unexpectedly. More than 2.5 million phones were recalled and replaced – one of the biggest recalls in consumer electronic history worldwide. Warnings on airplanes continued well into 2017, and Samsung has a long ways to go to rebuild trust with customers. Customers weren’t very forgiving of the technology company that couldn’t figure out its own technology not once, but twice, during a crisis. The company tried to keep the issues quiet and manage the outfall without much in the way of an apology or a solution. Customers and shareholders weren’t thrilled and Samsung is still working itself back up to its previous position on the mobile market. Admitting failure can be scary for customers. Companies are vulnerable when they expose a full range of customer reviews on their websites or social media accounts. The instinct is to put only positive reviews online or to cull the reviews so that only the best ones appear. Customers are savvy enough to do their own research, and when they realize that the company is deliberately hiding negative feedback, there is no reason for the customer to trust the company. And there is certainly no reason to buy from the company. The more reviews available to customers online, the more value they bring by presenting balanced reporting. Customers respond to company vulnerability by trusting the company more to tell the truth. 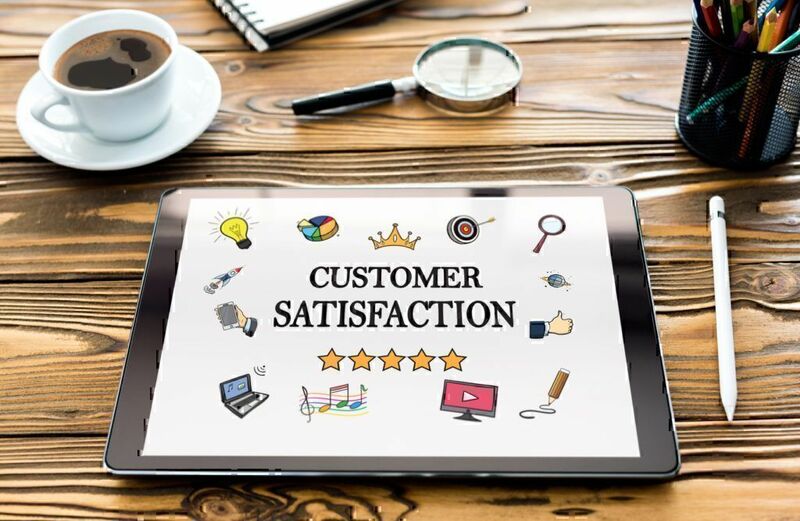 In fact, according to an EXPO survey, customer reviews are considered to be more than 12 times more trustworthy than the claims a company makes. Trying to keep things under wraps or hiding possible faults makes a company appear secretive and untrustworthy. Customers won’t work with companies they don’t trust. 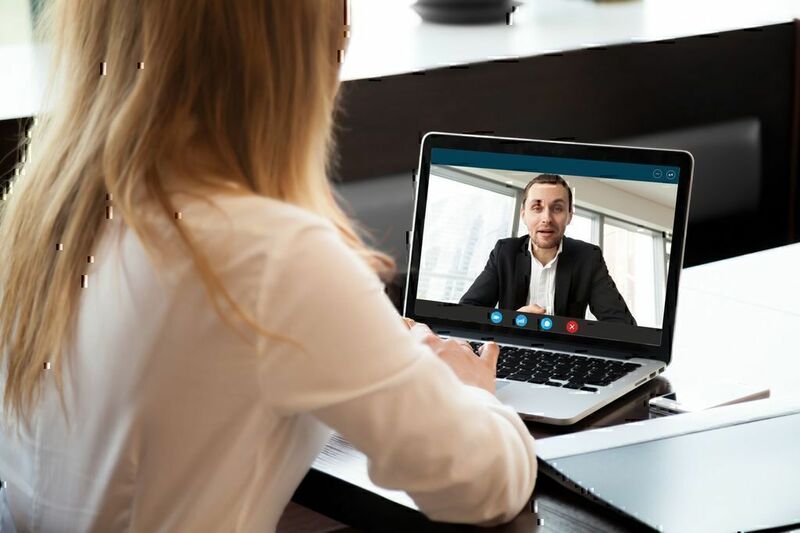 While trust is a cornerstone of the movement toward more transparency, there are other benefits as well that benefit both customers and employees. In 2013, a start-up company Buffer broke the start-up mold. It wasn’t the product or the office design that threw people for a loop. It was the blatant transparency. Many start-ups are heavily cloaked in secrets and hidden metrics. Buffer, on the other hand, shares everything – right down to the salary that is paid to each of its employees and why. Every month Buffer publishes a report available for the public that details its user base and revenues. It explains its current cash position. It discusses ongoing development. This information is available for anyone who cares to read the report. And every month you can expect an update. Easily the most interesting information released was salaries. Suddenly we all knew who was getting paid what and why they were making the amount. The formulas used to create salaries including seniority, company role, and incentives were all included in the report. Rather than a frenzy of in-fighting and dramatics, the company saw more internal applications for open roles. Employees weren’t horrified. They didn’t quit in drove when they found out what their cubicle neighbors were making. They were motivated by the numbers. They not only wanted to stay in the company, they wanted to grow even deeper roots. In fact, salary transparence has become a trend for all of the right reasons. Companies are being more open about salaries and the methodologies in creating them. Buffer may have made news as a start-up with blatant transparency, but they weren’t the first in all industries. Whole Foods released salary information in 1986, just a few years after founding the company. Google employees set up a shared spreadsheet where employees could anonymously share salary information. Another technology company, SumAll released the income figures for its 10 employees as a start-up. Now with five times that many employees, SumAll makes a point of publishing salaries internally every year. The employees value the information and are encouraged to approach their supervisors with questions about their own salaries based on what they have learned. Rather than trying to hide from the truth or trying to double-down on their current branding, Domino’s reinvented themselves publically. This isn’t a small potato – Domino’s is the second largest pizza chain in the world. And they put themselves out there in a big way. Domino’s understood customer feedback importance. They admitted the old recipe wasn’t a good one. They acknowledged that customers didn’t really like their food and that they were losing business in droves. They sought all of the feedback – both positive and negative – and then put it to use. Domino’s reinvented the crust, used a different sauce. Improve their cheese. And it paid off. The chain, again, already the second largest, saw a 14.5 percent increase in the first quarter of 2010 and a 16.5 percent increase in the first half of the year. Apparently honesty really is the best policy. Nobody brought in a repeat customer like high-end grocer Whole Foods. 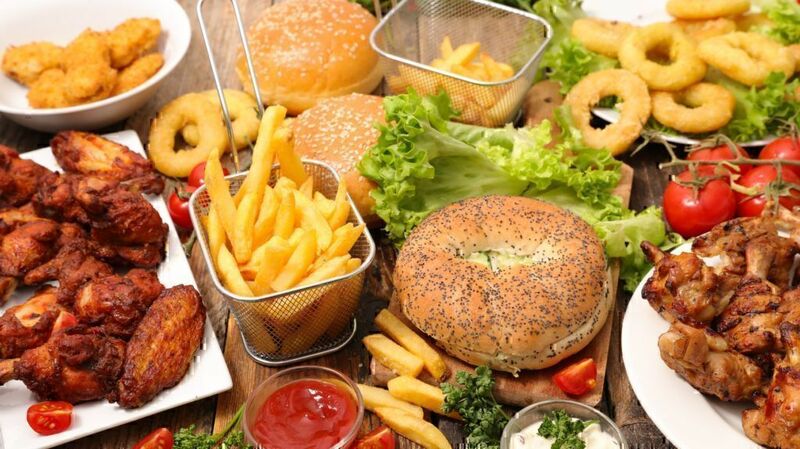 Health conscious shoppers with a large budget are the key customers for the specialty grocery store. These hyper-aware consumers make a demographic you can count on to come back for more – until they get a whiff that perhaps all is not what it seems. Whole Foods recently faced a class action lawsuit that accused the high-end grocery chain of intentionally mislabeling products. The lawsuit claimed that the company was using a non-GMO label for foods they knew to be genetically modified. When the news broke, the faithful customers began to disappear overnight. But Whole Foods fought back. Immediately the grocer decided on a strategy of transparency. If they were in trouble for hiding the process, they would now become the most transparent grocery store around. 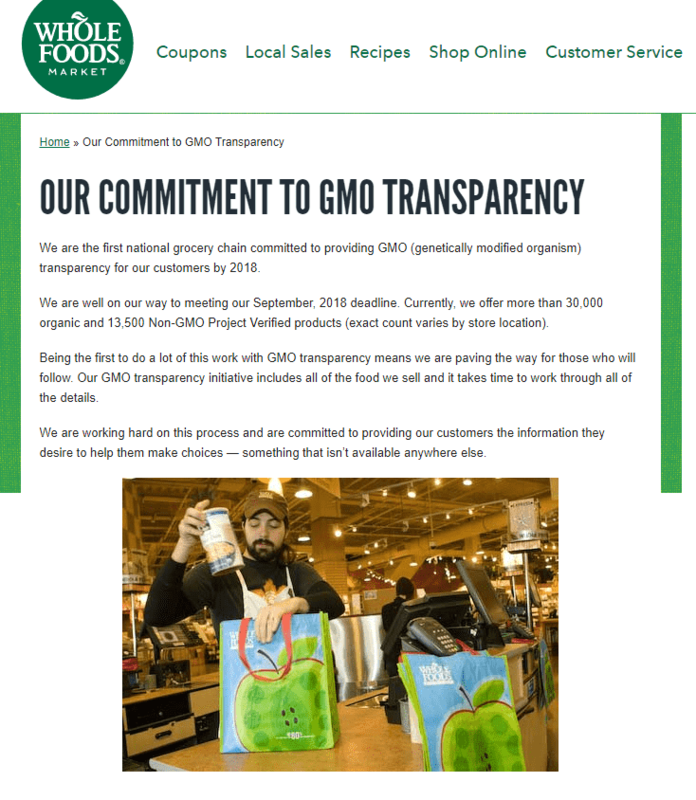 Whole Foods has a goal to have full, 100% transparency on GMO and non-GMO products. In 2018, Whole Foods will fully deploy the initiative in hopes of encouraging and industry-wide revelation. The company has always encouraged suppliers to use a verification process, and now the company will be mandating the verification of all goods being sold as non-GMO. Whole Foods needs a win. In the spring of 2017, the company posted its seventh consecutive losing quarter. When the marketing campaigns begin in earnest, the industry will see just how much customers appreciate the efforts Whole Foods is using to win them back. Since the likelihood of selling to an existing customer is close to 70 percent, Whole Foods may be on the right track. It helps that a full 70 percent of the buying experience is simply how customers feel they are being treated. Whole Foods is working hard to treat them well. Meanwhile, in companies like Zappos who have always had a policy of transparency. The company offers factory tours and impromptu question and answer sessions with employees, and it has worked to improve customer satisfaction. Sales have been steadily rising, thanks in part to the online retailer’s repeat customer base. Not every area of business should be open to full scrutiny. The secret recipe should probably remain secret. But there is a benefit to find the balance. Fortunately easing into professional transparency can have tremendous rewards and doesn’t have to include massive acts of rebranding. Companies worried about making changes to become more transparent can benefit from a few tips from those who have gone before. Encourage employee transparency. Buffer shook things up when it published salaries and the formula for calculating them. Secrets and backroom handshakes discourage employees. Open communication and clear messages inspire them. Encourage employees at every level to skip the secrets. Use clear pricing strategies. According to an Accenture customer survey, customer care far less about price than they do about customer service. Using a clear pricing strategy, even if your prices are higher than the competitor’s ones, shows that you care more about honesty and the customer experience. Customers like this sort of thing and will pay a bit more for it. Fully explain guarantees. A company can hide a lot of sins in a well-worded guarantee. Customers are increasingly savvy when it comes to shady promises that can’t be met. Explaining a guarantee and including details about what exactly customers can expect leads to transparency and customer confidence. Share mistakes and successes. Some companies are skittish about sharing all reviews. They worry about the impact of negative reviews and what they might mean to the bottom line. They are right to worry. Econsultancy found that at least 61 percent of customers read reviews before a purchase. But it’s not all bad news when negative reviews show up. Customers tend to trust companies that allow mistakes to show more. This is especially true when companies make a public effort to improve the situation and to apologize. Toyota got a taste of humble pie when they published the Commitment ad campaign as an apology in 2010 for a massive recall for “sticky accelerator issues.” Toyota – a brand built on superior quality – took ownership of the issue, apologized, and almost nobody remembers the issue today. Be open about changes in a company. Domino’s taken a tremendous risk when they publically announced just how badly their pizza was being received by their own testing groups and customers. They told us it was terrible, and then they told us how they were going to fix it. And fit it, they did! Chipolte also overcome some serious negative press. When news broke about food poisoning at the restaurants, the company moved quickly to close not just the restaurants where incidents had been reported by a total of 43 storefronts. They hired food experts, sanitized everything, worked with inspectors and told their customers about the process every step of the way. The company is now operating above industry standards. Changes in a company are always a time of potential turmoil and shake-up. Hiding those changes behind lies, half-truths and sneaky verbiage harms customer relationships and employee morale. Being transparent about the upcoming developments and reasoning is just as important about the actual changes. Businesses realize quickly that customers want clarity and open communication. They are learning customer feedback importance truly matters in both the short and long term. Customers are realizing just how much power they have over companies through social media and reviews. Together the two forces are leading us to an increasingly honest marketplace where not only customers enjoy openness and insights, but employees thrive in the transparent workplace.